By introducing native plants and some strategic design features to your garden, you can provide patches of natural habitat for many species. A well-designed backyard offers birds and pollinators — like butterflies — more living space, feeding opportunities and cover from predators. By enhancing and restoring natural elements in your garden, you'll make the urban landscape more wildlife-friendly. Before you start, find out what kind of soils and natural plant communities once existed in your area. 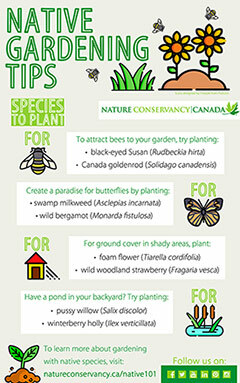 This will give you a better idea of the types of native plants that should thrive in your garden. 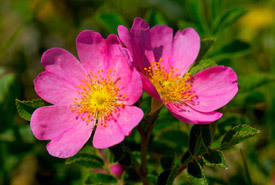 There are a number of good websites to help you identify native plants in your area. Also, think about the desired long-term look and feel of your backyard. Are you drawn more toward an open, sunny space filled with a meadow or prairie garden? Or is a shaded woodland garden more to your liking? If you're planting trees, consider their size at maturity and whether they will still be suitable for the space in 20, 40 or even 60 years. Consider their position relative to overhead wires and nearby buildings. As well as the plants, plan for other features, such as a small pond with trickling water to attract birds and perhaps even a few frogs. Or consider a small brush pile to provide cover for small birds, such as winter wrens as they migrate through neighbourhoods in spring and fall. In what season do you most enjoy spending time in your garden? If you spend time away in July and August at a summer cottage, you may want to avoid planting species that flower while you are away. On the other hand, if you entertain in your backyard all summer long, summer flowering plants may be a good choice. A naturalized garden may need less work than a more traditional garden. However, until it is well established, you'll need to give it some maintenance, including careful watering during droughts. Once you've considered these questions, you’re ready to begin sourcing your plants. Start by asking garden centre staff about where their plants are grown. Many nurseries import plants from hundreds or even thousands of kilometres away. While they may carry the species you are looking for, the selection (if imported) may not be hardy to your backyard conditions. It's best to find a nursery that can guarantee that its plants have been grown locally. Once you have found a garden centre that sells native plants, you should also ask them whether the plants you have selected were propagated under cultivation and not dug out of the wild. Although a naturalized garden may be less formal than a manicured garden, they're not necessarily maintenance-free. If done well, a naturalized garden may require less watering and be able to survive periods of drought more easily. Native plants are also often better adapted to the local climate. They also exhibit a higher tolerance to pests than many garden ornamentals. As a result, naturalized gardens can often thrive without the use of pesticides. In fact, a naturalized garden might even attract "beneficial" bugs that are predators of other pest species. If invasive weeds are not removed on a regular basis, they will compete with the native plants in your garden and can spread to nearby natural areas. You may even need to manage some of the more aggressive native species or else they can take over the garden. Although nature may thrive without human intervention, your yard exists on a much smaller scale and isn't operating entirely as it would in nature. 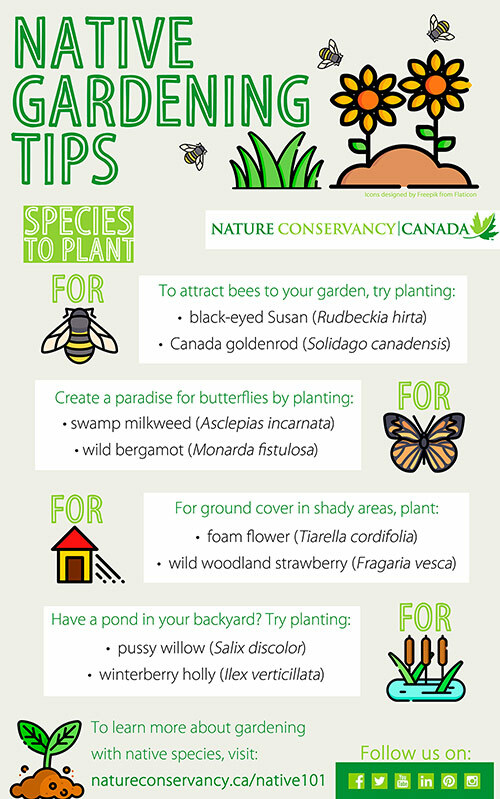 Not unlike the work of NCC’s stewardship staff on properties across Canada, you may need to carefully manage your garden to ensure that its diversity is restored and maintained over time. You will need to help some of the conditions for naturalized plants to thrive in, especially through weeding and watering. Urban neighbourhoods often have significantly lower water tables than natural landscapes, so it’s important to water plants in extended dry spells. A naturalized garden will almost certainly increase the number of wildlife sightings in your backyard. Plants with a high nectar content attract butterflies and hummingbirds. Some native plants that produce berries in late summer or early fall will attract forest songbirds on their southward migration. A well-placed small pond feature with trickling water may attract both birds (which key in to woodland stream sounds) and amphibians such as green frogs (which disperse across the landscape in summer). A naturalized backyard can also be fun for kids, who naturally seem to love exploring wetlands and creeks, getting muddy and dirty and discovering new bugs and plants right in their own backyard. These gardens and the wildlife that visits them can really help get kids excited about nature. Watch this "Get Your Lawn off Grass" video, below. The late Bill Freedman, former NCC volunteer and member of NCC's Board of Directors, describes how he naturalized his urban garden. For more information on the Dr. Bill Freedman fund, click here.